What is the Eye Wrinkle Correcting Laser? 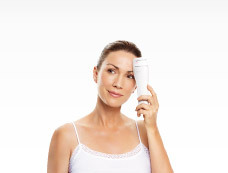 It is a hand-held small laser device that is uniquely designed for treating the eye area to smooth fine lines and wrinkles. The Eye Wrinkle Correcting Laser corrects fine lines and wrinkles around the eyes for eye-opening results in just 2 minutes a day. Which technology does the Eye Wrinkle Correcting Laser use? The Eye Wrinkle Correcting Laser uses non-ablative fractional laser technology. Non-ablative laser uses a wavelength that does not cause the water in the tissue to evaporate (ablate) but rather the laser energy heats the tissue in a controlled manner. The rise in temperature stimulates the making of new (fresh) collagen produced by the body. Collagen is a fibrous protein that is responsible for giving the skin its elasticity and suppleness. By producing new collagen, the skin regains is youthful appearance. Click here for a video to find out how it works. How does the Eye Wrinkle Correcting Laser compare to professional salon treatments? Dermatologists use non-ablative fractional laser technology in their professional salons to treat facial lines and wrinkles. Today, Tria’s dermatologists-recommended Eye Wrinkle Correcting Laser allows you to use the same core laser technology to treat eye wrinkles in the convenience of your own home. How does the Eye Wrinkle Correcting Laser compare to the anti-ageing products that I am already using? Unlike skincare products, the Eye Wrinkle Correcting Laser emits microscopic columns of laser light to help stimulate new collagen below the skin’s surface. By using the Eye Wrinkle Correcting Laser only 2 minutes a day, you can expect to see visible improvement in as few as 2 weeks. Can I treat other areas? The device has undergone extensive clinical trials and is US-FDA cleared for use around the eye area. We do not recommend using on other areas of the body as it has not been tested and the benefits and risks are unknown. If you are looking to reduce wrinkles on your whole face, our Age-Defying Laser might be a good option for you. Can I use it on my eyelids? Do not use the Eye Wrinkle Correcting Laser to treat your eye or eyelids and do not aim the device directly into your eyes. Doing this could cause serious eye injury such as a permanent or temporary decrease in vision or permanent blindness. Treat around the eyes only where you can feel bone beneath the skin. How long do I have to treat? Treat for one minute per eye every evening for 8 weeks. After the 8-week treatment period, please allow for a 4-week downtime before continuing another 8-week treatment schedule/plan. Learn how to use the Eye Wrinkle Correcting Laser here. Can I use the Eye Wrinkle Correcting Laser more than once a day? No, we do not recommend you treat each eye area more than once per day (once every 24 hours). Doing this could result in increased risk of skin irritation. We recommend you treat in the evening as you may notice some temporary redness around the area of the skin that has been treated, this is normal. Treating in the evening will allow the redness to diminish overnight and for your skin to renew. Do I need to cleanse my face before treatment? Use a cleanser to thoroughly cleanse the skin by removing all traces of makeup, sun cream and other impurities that can interfere with the laser light. For best results we recommend using our Age-Defying Priming Cleanser that is specially formulated for use with laser-treated skin. Users typically notice an improvement in their skin in as few as 2 weeks, followed by fewer lines and wrinkles occurring, with the best results occurring a few weeks after the 8-week course of treatment. What will my skin look like during treatment? You may notice some temporary redness of the skin where you treated. This is a normal reaction, which most people find diminishes over time as the skin adjusts to the treatments. 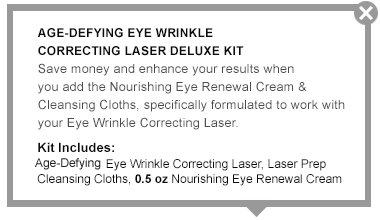 We recommend using the Nourishing Eye Renewal Cream to help nourish and soothe laser-treated skin. What skin products should I use after my daily treatment? 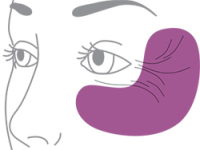 After treatment, apply a nourishing eye cream. For best results, use our Nourishing Eye Renewal Cream, which is expertly formulated to complement your nightly laser treatments. I just finished my first 8-week treatment. What now? We recommend taking at least a 4-week break to allow the cellular renewal process to continue. Many consumers of the Eye Wrinkle Correcting Laser products have chosen to continue use after this break if additional anti-ageing benefits are needed. Remember, you treat for daily for 8 weeks and then have a 4-week break, you can repeat this treatment cycle as many times as you desire. How long should I use the Eye Wrinkle Correcting Laser? When is the process fully complete? You should use your Eye Wrinkle Correcting Laser 7 days per week for 8 weeks, with a downtime of 4 weeks. When you feel like you are ready for an additional treatment, treat for another 8-week cycle. Is the Eye Wrinkle Correcting Laser safe for me to use? / When should I not use the Eye Wrinkle Correcting Laser? The Eye Wrinkle Correcting Laser is suitable-for all skin types. Do not use the device if you are under the age of 18. The use of the device on or by anyone under the age of 18 has not been tested and could result in serious skin or eye injury. Do not use the device if you are pregnant. The devise has not been tested for safety on pregnant women and the risks are unknown. Consult a health care professional first if you are undergoing professional cosmetic treatments, such as a skin peel, laser resurfacing or filler injections. Also consult a health care professional if you have a significant medical skin condition, your skin is unusually sensitive, your skin easily develops a rash or allergic reaction or if you are taking a medicine, such as a steroid. The Eye Wrinkle Correcting Laser should also not be used on skin that contains permanent makeup or is tattooed, infected, burned or cut. What are the possible side effects when using the Eye Wrinkle Correcting Laser? During treatments, you may feel mild discomfort such as a slight warming or prickling sensation. Redness of the skin may also appear, these are all normal side effects and generally subside within a few minutes or hours but may continue throughout treatment. These side effects can diminish with continued use as the skin adapts to the treatment. The Nourishing Eye Renewal Cream can help minimise these side effects. If I have recently visited a Dermatologist or Skin Specialist for an anti-ageing treatment, how long should I wait before using the Eye Wrinkle Correcting Laser? We recommend you consult a health care professional before using the Eye Wrinkle Correcting Laser. If you have undergone treatment, wait until the redness and/or swelling have dissipated. Do not treat if your skin is significantly red or swollen from a previous treatment. Can I use the Eye Wrinkle Correcting Laser if I have botox treatments or fillers? We recommend you consult a health care professional first if you are undergoing professional cosmetic treatments, such as a skin peel, laser resurfacing or filler injections. Can I use it if I have tattoos or permanent make-up in the treatment area? The Eye Wrinkle Correcting Laser should not be used on skin that contains permanent make-up or is tattooed. Is it safe for me to be in the sun during the treatment period? We recommend you wear sun protection at all times. If you are planning a holiday within intense sun then we recommend you stop using the Eye Wrinkle Correcting Laser at least 2 weeks before you plan to go away and allow at least 2-weeks upon your return before beginning your treatment again. Protect your skin by applying a broad spectrum sunscreen of at least SPF 30 every morning. Daily sun protection will protect healthy skin created by your Eye Wrinkle Correcting Laser to maintain results longer and help prevent new photodamage. Does the treatment hurt? / What sensation can I expect during treatment? During treatments, you may feel mild discomfort such as a slight warming or prickling sensation. Some users describe feeling a slight stinging or warming sensation during treatment and may notice some temporary redness. This is normal and will diminish. To help your skin adjust to the treatment, we recommend you start on the low setting initially, this helps your skin adjust to the treatment. Increase to medium and high settings to achieve the best results. Will I achieve better results by using the Tria Eye Wrinkle Renewal Cream? Although it is not a requirement to use our skincare, we recommend using the Nourishing Eye Renewal Cream when using our laser. Our skincare has been specifically developed by expert dermatologists and include ingredients that are beneficial to the skin when treating with a laser. How long will my device take to charge the first time? Your device will take up to 2 hours to charge. Contact our customer service team at 0800 0484 322 9AM - 5:30PM (GMT) or send us an email. Check the customer support section here.